▪ Justice Neil Gorsuch’s first recorded vote on the Supreme Court was a tiebreaker that allowed Arkansas to execute its first death row inmate in 12 years, in a 5-4 vote. ▪ Opioid makers and suppliers have spent $880 million in the past decade lobbying state and federal legislators to block new regulations on their addictive painkillers and make the drugs more easily available. That’s eight times as much as gun makers spent on lobbying during that time. ▪ International Space Station commander Peggy Whitson this week became the U.S. astronaut with the longest cumulative time spent in space, logging 534 days, 2 hours, 49 minutes and counting. 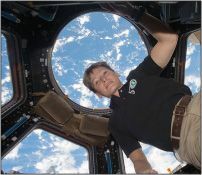 By the time she finishes her mission, in September, Whitson will have clocked more than 650 days in space. ▪ President Trump raised a record-breaking $107 million for his inaugural festivities— about double the record set by President Barack Obama in 2009. Las Vegas gaming billionaire Sheldon Adelson donated $5 million, while five NFL owners chipped in $1 million each. Pfizer, Dow Chemical, and the Bank of America also gave $1 million each. ▪ The number of anti-Semitic incidents in the U.S. spiked following the November election, and the pace of such incidents has accelerated over the past five months, according to the Anti-Defamation League. There has been an 86 percent increase in incidents of vandalism and bullying since January 1, and a total of 541 reports of anti-Semitic incidents in the first quarter of 2017—including 161 bomb threats, 155 acts of vandalism, and six assaults.